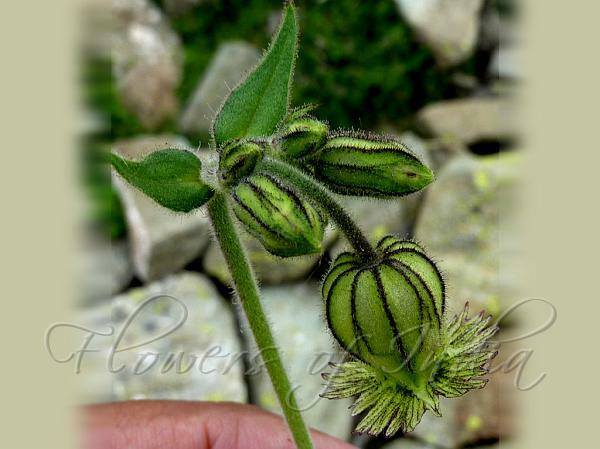 Kashmir Campion is a perennial herb, 50-70 cm tall. Stems are erect, densely shortly whitish hairy. Basal leaves wither away early. Stem leaves are stalkless, ovate or ovate-lanceshaped, 5-7.5 cm × 6-15 mm, both surfaces sparsely hairy, ciliate at margin, base narrow or nearly rounded, tip pointed or long-pointed. Flowers are borne in sparse, few flowered flat-topped clusters. Flower-stalks are slender, glandular hairy. Bracts are lanceshaped, herbaceous, glandular hairy. Sepal cup is pale green, bell-shaped, 1-1.7 cm × 7-9 mm; longitudinal veins violet-blue or brown, prominent, meeting at calyx teeth. Calyx teeth are triangular-ovate, 3-5 mm, margin membranous, ciliate, tip pointed or long-pointed. Petals protrude 6-8 mm beyond the sepal cup, yellowish green or pale green, 1.2-1.5 cm. Claws are saccate-oblanceolate, hairy at base, ears ovate. Limbs are broadly ovate, 5-8 mm, bifid. Petals are entire or fringed, with teeth or small lobes on each lateral side. Coronal scales are round, about 1.5 mm, slightly wavy at the tip. Stamens remain inside, about 1 cm. Styles are 4 or 5, about 3 mm. 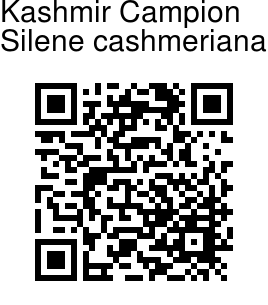 Kashmir Campion is found in the grasslands and scrublands in Kashmir, at altitudes of 3000-4100 m. Flowering: July-August.